Face Jug, 1860-1880. Chipstone Foundation. Photo by Jim Wildeman. Last month I wrote about the Chipstone Foundation’s new acquisition, an early Edgefield face jug with writing on the back. Since then, our curatorial team has uncovered the meaning behind the elusive inscription. Before revealing this discovery, I’ll catch you up on new research for Face Jugs: Art and Ritual in 19th-Century South Carolina, on view until August 5 at the Milwaukee Art Museum. “Face jugs” is a term created by art historians, historians and archeologists to refer to turned stoneware vessels with applied faces. The eyes and the teeth are made of kaolin, a white river clay that is one of the primary components of porcelain. You will notice when you visit the exhibition that there are also face cups and face pitchers. 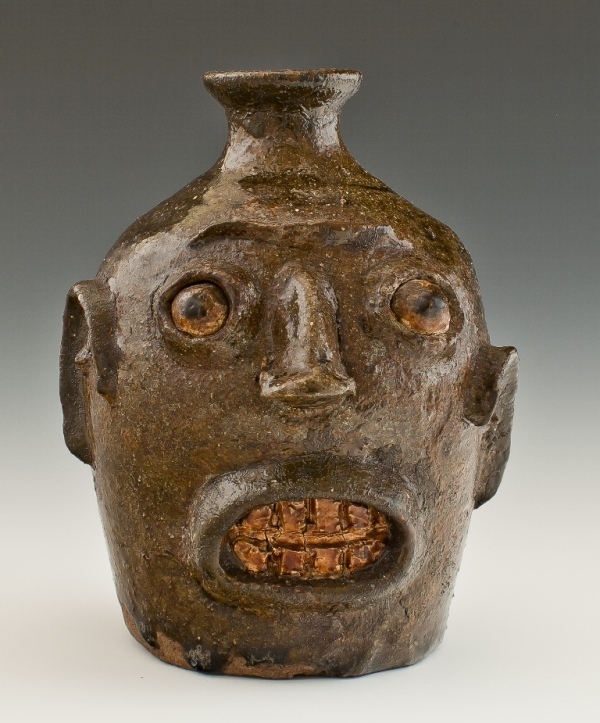 Many different cultures have created pottery with faces or human elements, but the Edgefield face jugs are unique. For starters, we know very little about them. We know that Edgefield face jugs were created by slaves, and later free African Americans in the that district of South Carolina. We know that they were made from about 1860 to about 1880 or so, when they suddenly stopped being produced. We know that the form was appropriated by white potters in the 1880s. Unfortunately, though, their origin, function, and meaning was lost with time. How do you begin to research a subject like this? Scholars have been interested in face jugs since the 19th century, and have all speculated as to their significance, but none have delved into the subject in depth. Because it was illegal in 19th-century South Carolina for slaves to write, there are no known first-hand documents explaining the face jugs. In fact, there is only one known quote from this time referencing face jugs, and it is not from one of the makers. Thomas Davies, a plantation and pottery owner in South Carolina, told Edwin Atlee Barber in 1893 that he remembered his slaves making face jugs during their free time in 1862. This information was definitely a start, as was reading everything that had already been written about the topic of face jugs. In order to better understand our subject our curatorial team needed to step away from the usual art historical methodology and take an anthropological multipronged approach. Our research expanded to include archeologists, genealogists, African art experts, scholars on slave culture, scholars on African religion and scholars on African American religion. 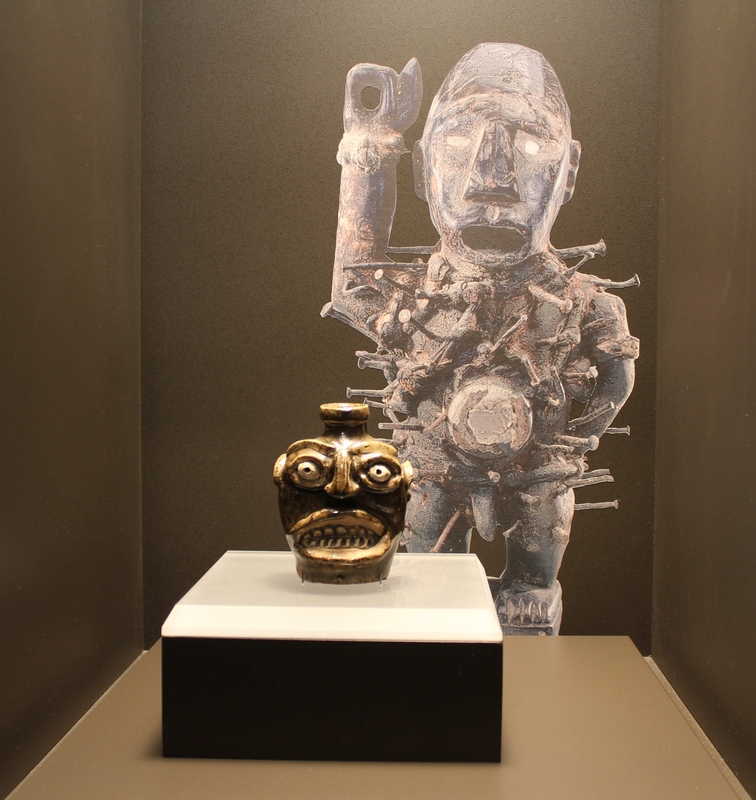 In order to begin to understand the objects, it was important for us to try to understand the people that made the face jugs and the environment in which they were forced to live. The story that unfolded is truly amazing. Scholars have hinted at a connection between the face jugs and Africa since Edwin Atlee Barber first referenced them in his 1893 book, The Pottery and Porcelain of the United States. At first, this seemed like a slight stretch as the importation of enslaved Africans into the United States was declared illegal in 1808. Most slaves in South Carolina at this time were thus second, third or fourth generation African Americans. Face jug with nkisi image shown together in "Face Jugs: Art in Ritual in 19th Century South Carolina". Face Jug, 1860-1880, Collection of Carl and Marian Mullis. Photo by Jon Prown. In 1858 an event occurred that is now believed to have been the catalyst for the face jugs’ creation. That year the Wanderer, a luxury yacht turned slave ship, landed illegally on the coast of Jekyll Island, Georgia. It carried 407 enslaved Africans, most of which were from the Kongo culture. Over 100 of these Africans were transported to Edgefield, and some were sent to work in the potteries. There is evidence of at least one Wanderer slave, Romeo, working in Thomas Davies’s pottery, the Palmetto Fire Brick Works. The Kongo (“Kongo” refers to a group of people and to their culture, whereas Congo usually refers to the Democratic Republic of Congo) have a strong belief in the powers of ancestors and spirits. A nkisi is a container for these spirits, shown in the picture above right. A village’s nganga, the Kongo word for diviner, fills a nkisi up with magical materials, including white river clay, thus activating the object. The spirits come into the nkisi and become trapped inside. The nkisi can then be asked for help. The WPA South Carolina slave narratives constantly speak of the acceptance and fear of conjures. Our curatorial team conceives that face jugs were a response to learning about nkisi combined with an already present trust in conjure. It represents a combination of two cultures’ beliefs. 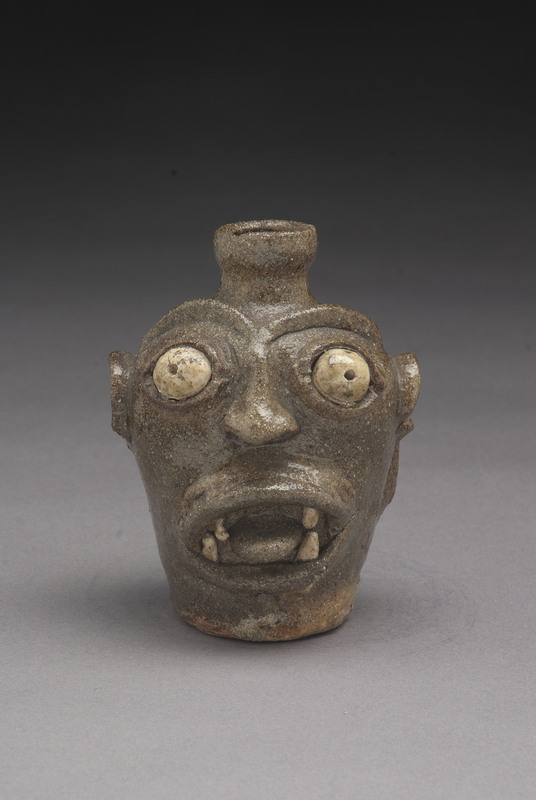 Face jugs were meant for ritualistic, rather than functional use. This argument was strengthened by the Squire jug that I spoke about in an earlier blog post. It turns out that after spending days looking at the writing [pictured above], it doesn’t spell Squire Peter or Squire Posey, as we initially thought. It spells “Squire Pofu”. Although we originally discarded the idea because it wasn’t a known word in the English language, a quick search turned up that Pofu is a town in the Congo. Not only that, but pofu means blind in Swahili. If you look closely at the face jug’s eyes at the left, you’ll see that they are colored black. This is the only face jug I’ve seen with black eyes. Following Swahili grammar structure, “Squire Pofu” translates to “the blind Squire”. Could this have been a conjure jug to cause blindness? Our research is still just beginning. The exhibition Face Jugs: Art and Ritual in 19th-Century South Carolina provides us with the incredible opportunity to view 23 of these early face jugs together. Sitting in front of the wall of jugs, connections start to appear. I hope you get the opportunity to come to the Museum’s Lower Level to the Decorative Arts Gallery to view and think about these wondrous faces that have stood silent for too long. This entry was posted in Art, Curatorial, Exhibitions and tagged 19th Century Art, African American Art, Ceramics, Decorative Arts, Exhibitions, Face jugs, research, southern art. Bookmark the permalink. Like a bottle spell! Fascinating. I would postulate this : as a mambo asogwe of Haitian Vodou, I know that faces on bottles are often ancestors remembered. One of our ritual tools is a govi, often inscribed with the veve or symbol of the spirit that resides within. “Squire Pofu” may be referring to the maker’s ancestor who was blind, not a bottle to make someone blind. And the faces on the jugs were faces known to the makers — ancestors left behind in Africa, who are remembered through art and decoration. Is there going to be a book or photographic reference of this display? Mark, there is currently a gallery guide with images and information. Chipstone will also create a virtual exhibit that will reside on our website http://www.chipstone.org. Mambo Vye Zo, thank you for your comment. It’s interesting how African traditions and beliefs were adapted in the African diaspora. I will look into the govi, but in order to make the comparison and draw conclusions, one would have to find a Haiti-Edgefield connection. The pofu explanation is intriguing. Some questions come up, though. First, can we know that the people in Edgefield who made the jug were Swahili speakers? Second, could ‘pofu’ be in fact a spelling of ‘upoto’? The Upoto people of the Congo file their teeth to sharp points; several of the face jugs appear to have filed (or at least very sharp) teeth. Mambo Vye Zo mentions a possible Haitian-Edgefield connection–weren’t people from the Kongo people taken to Haiti as well as to Edgefield? Jaan, we know that many of the Africans that came over on the Wanderer spoke Kikongo. Mpofo (which sounds like pofu as the “m” is silent in Kikongo) means to make blind in Kikongo. Your upoto suggestion is interesting. We will definitely look into it. I’m not sure what African groups were enslaved in Haiti, but that is an interesting piece of information to research as well. Thank you for your insight!